Today technology has reached everywhere and there is hardly any sphere of life which is untouched by it. India being one of the fastest developing country is getting digitalized day by day and recent internet growth in India is unlike anything in the history of commercial internet and even as the rate at which people are coming online is not very fast, India is working towards making internet more affordable for its people to scale continuous growth. 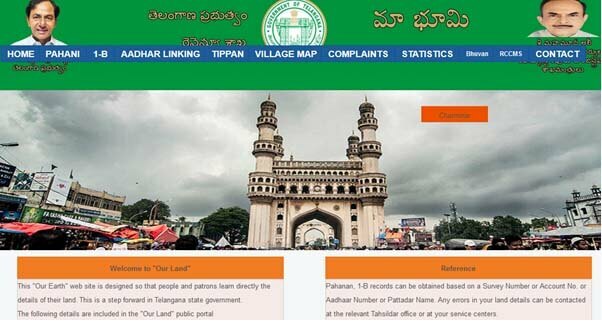 Both the state and central government are working on digitization of their departments in order to provide most of the services online to the general mass and Telengana State Government has walked one step further in the direction of digitization of its departments by taking an initiative by the name of Maa Bhoomi. The Government of Telangana is working round the clock for the benefit of its people and very oftenly comes up with schemes to make life of the Telengana people easier and comfortable by arranging the facilities and making them accessible as well and since majority of Telengana population belongs to the agricultural background, Telengana State Government has come up with Maa Bhoomi to make life easy for the farmers and making their job easy if they want to know about their land without visiting MeeSeva centre. Telengana State Government in association with NIC Hyderabad has developed Maa bhoomi i.e. an online land record website for the state and it was launced in February 2016. The prime reason behind the launch of Maa Bhoomi website was that maintenance and upkeep of physical documents in files and folders need proper maintenance, storage and manual labour. Also it is difficult and at times impossible to find data stored in the physical files and folders and Telengana being a big state was facing problem in storing its land records and to give information to people about their land was another uphill task Telengana State Government was not willing to do and thus it came up with the solution of digitising all land records and thus the idea of Maa Bhoomi was conceptualised and implemented and to add one more feather to its cap Telengana State Government has also launched the app version of Maa Bhoomi which is available for all android users and thus they can access and Maa Bhoomi, as appears from its name means our land and was launched with the objective of helping landowners and cultivators to go through the government records of their own land online rather than approaching the concerned office everytime for getting information. Telengana State Government launched Maa Bhoomi website and it was launched by then Chief Minister Sri. K.Chandrasekhar Rao. Land records of 10 Telengana States i.e. Rangareddy, Medak, Hyderabad, Mahaboobnagar, Nalgonda, Nizamabad, Karimnagar, Warangal and Khammam are available on Maa Bhoomi website and same can be accessed by the common people. Also details like extent of land, survey number, owner name/Pattadar name, tax, nature of the land and crop and other relevant details related to land is available and can be accessed by its people. Homepage of the website looks like the image below. Pahani/Adangal – One can both view Pahani/Adangal details and apply for Pahani/Adangal. Record of Right 1B – One can view details of Record of Right (ROR1-B). Since Adangal is maintained by the Village Administrative Officer, it is his job and duty to fill in details like crops that are raised in the land, trees standing on all government lands, irrespective of whether it falls under tree tax system or not, cases of unauthorised occupation of Government lands, cases of Fasli, Jasthi and Theervai Jasthi etc. Go to Maa Bhoomi website. Click on “Our Pahani” link under “Pahani” section of the website. Search your Pahani by Survey number or Account Number or Aadhar number. You can choose either of the option as per the information available with you. Select District name, Zone name and Village name where your property is located. Select and enter Survey Number and click on submit to generate your Pahani. Record of Right (ROR 1B): Record of Right (ROR 1B) contains details like details of the property such as ownership details of the property along with details like Khatadar name, his father’s name, Khata number, survey number, classification of land and revenue detail. Record of Right document is issued and maintained by the Tehsildar and is issued separately for each village. A sample format of Record of Right page would have 14 columns. Like Pahani, Record of Right document is also a very vital document because it contains ownership details of a land. In order to apply for ROR document, you need to apply to the Tehsildar at your nearest Mee Seva centre by paying the applicable fees of Rs 25. Once issued, ROR document gets uploaded on the Maa Bhoomi website from where you can see and print the document as and when you wish to. To see the ROR document, go to the IB section on the Maa Bhoomi website and click on “Your ROR 1B” in order to see the document. On this page you have to enter your Survey or Aadhar number and select your district, zone and village from the available drop down menu. And like it was the case with Village Pahani, you can see Village ROR as well on the Maa Bhoomi website by clicking on “Grama ROR 1B” and you can see the document after entering your district, village and zone name from the drop down list. Land Tippan: Land tippan is a document which is prepared during conducting the land survey and it contains details of field measurements parcelwisse and like Pahani and ROR, Land Tippan can also be viewed on the Maa Bhoomi website by selecting Tippan option on the Maa Bhoomi website. On this page you would need to enter information like your district name, zone name, village name and FAI code. Aadhar linking to account number: Maa Bhoomi also caters for linking your aadhar number to the account so that you can have access to most of the uploaded documents. Filing complaints regarding any services: In case you are facing any problem in accessing any of your documents like Pahani, Adangal, ROR or Land Tippan, you can register your complaints on the Maa Bhoomi portal giving a complete description of problem and also check the status of your complaint and since Maa Bhoomi can be downloaded on your android mobile, you can check the complaint status from anywhere. Amazon Global Selling - How to Start Selling Globally with Amazon?